Looking for information about the Western Fair District? You’ve come to the right place! For General Inquiries please contact us in person at Grandstand Guest Services (located in the Grandstand lobby) or Clubhouse Guest Services (located in the Administrative Building) - see below for building hours - or email us anytime at contact@westernfairdistrict.com. Hours are based on ice rentals. 4000+ FREE parking spots available. 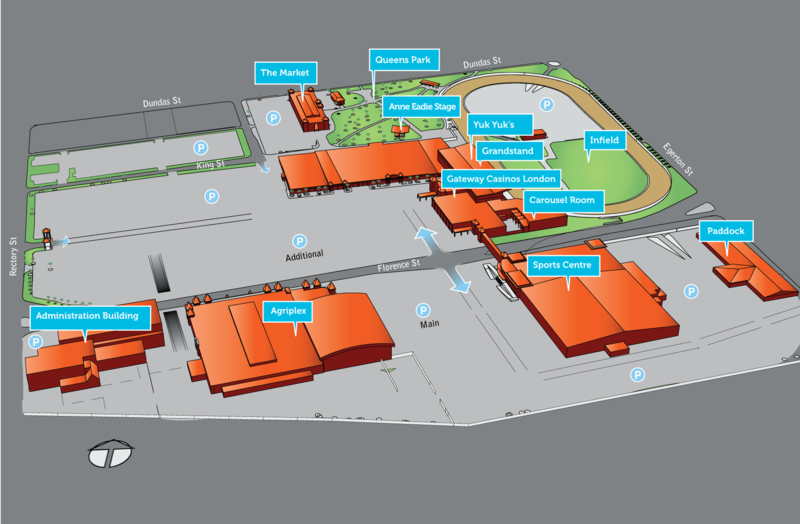 If traveling by VIA Rail, Western Fair District is a 5 minute cab ride away. Take the 401 West to the Highbury Avenue exit at London. On Highbury Avenue, head North to Florence Street. Turn left onto Florence Street. On Florence Street, head West until you come to Rectory Street. Turn right onto Rectory Street. The main entrance to the Western Fair District is immediately on your right-hand side. Look for the big colourful “Western Fair District” logo above the gate. Take the 401 East to the Wellington Street exit. On Wellington Street, head North until you reach King Street (downtown). Turn right onto King Street, which is a one-way street and head East. Turn right onto Rectory Street. The main entrance to the Western Fair District is immediately on your left-hand side. Look for the big colourful “Western Fair District” logo above the gate. Take the 402 to the 401 and then take the first London exit at Wellington Street. On Wellington Street, head North until you reach King Street (downtown). Turn right onto King Street, which is a one-way street and head East. The Western Fair District is located at the dead-end of King Street; therefore, you should have no problem finding our exciting entertainment venue. Take the 400 until you come to the 401. Head West on the 401 (London) Take the first exit into London which will be the Highbury Avenue exit. On Highbury Avenue, head North to Florence Street. Turn left onto Florence Street. On Florence Street, head West until you come to Rectory Street. Turn right onto Rectory Street. The main entrance to the Western Fair District is immediately on your right-hand side. Look for the big colourful “Western Fair District” logo above the gate. Western Fair District has set policies and procedures that take into account the Accessibility for Ontarians with Disabilities Act. To learn more about our policies please contact: hblackwell@westernfairdistrict.com.